Looking for something fun to do in Hampton Roads? There are so many fun things to do with kids! Here are 100 things to do in Hampton Roads broken up into cities: Virginia Beach, Chesapeake, Norfolk, and Portsmouth. 1. Hit up the boardwalk at Virginia Beach. 2. Pet some farm animals at Hunt Club Farm. 3. Pick up some fresh fruits and veggies at the Virginia Beach Farmers Market. 4. Check out some fishies at the Virginia Aquarium. 5. Play at the Children’s Play Area at the Lynnhaven Mall. 6. Get some space education at the Virginia Beach Planetarium. 7. Fly a kite and play at the fun Kids Cove at Mt. Trashmore. 8. Go swimming at any one of the 7 Virginia Beach Recreation Centers. 9. Bring out your senses and imagination while playing at Green Bean Contemporary Child’s Play. 10. Ride go carts at Motor World. 11. Ride some water slides at Ocean Breeze Waterpark. 12. Bring out your creative side at the Virginia Museum of Contemporary Art. 13. Walk through the Old Coast Guard Station. 14. Throw a penny in the fountain at Town Center. 15. Paddleboard on the water with Rudee Inlet Stand Up Paddle. 16. Climb, slide, and ride at Fun Ville Playground and Cafe. 17. Play some putt-putt golf at Jungle Golf. 18. Enjoy pizza and games at Planet Pizza Space Grill. 19. Ride the Ferris Wheel at Atlantic Fun Park. 20. Snap a shot in front of King Neptune’s Statue on the Boardwalk. 21. Take a pirate adventure aboard Capt. Jack’s Pirate Adventures. 22. Take a hike through First Landing State Park. 23. Bounce away at Virginia Beach Bounce House. 24. Take the family bowling at Pin Boy’s at the Beach. 25. Take the kids to a beach playground at JT’s Grommet Island Beach Park. Check out this valuable resource, VirginiaBeach.com, for other awesome things to do around Virginia Beach! 1. Go airborne at Cloud 9. 2. Walk the lake at Oak Grove Park. 3. Set up a kid friendly spa day at the Klumsy Moose. 4. Bounce away at Kangaroo Jac’s. 5. Go ice skating at Chilled Ponds Ice & Turf Sports Complex. 6. Go bowling at AMF Chesapeake Lanes. 7. Have a family picnic at Battlefield Historic Park. 8. Check out the gardens and trails at the Chesapeake Arboretum. 9. Have a paintball war at Chesapeake Sports Park. 10. Enjoy some free programs about our universe at the Chesapeake Planetarium. 11. Take the kids to skateboard at Chesapeake City Park’s Skate Park. 12. Take a bike ride around the Dismal Swamp Canal Trail. 13. Be creative at Glazenfyre: A Paint it Yourself Pottery Studio. 14. Pet some farm animals at Bergey’s Breadbasket. 15. Take a swim lesson at Great Bridge Swim and Racquet Club. 16. Take the kids to play at Fun Forest at City Park. 17. Get some shopping done at Greenbrier Mall. 18. The kids always have loads of fun at Chuck E. Cheese’s. 19. Eat while watching a movie at the Cinema Cafe. 20. Take the kids to an arcade at Game Works. 21. Enjoy glow in the dark miniature golf at Partee’s 3D Blacklight Mini Golf. 22. Go for a ride with Adventure Kayak Tours. 23. Go horseback riding and zip lining at Triple R Ranch. 24. Take a gymnastics class at Ocean Tumblers Gymnastic School. 25. Get your kiddos up and moving at a fun class at The Little Gym. 1. Take a cruise through the Harbor on the American Rover. 2. Take a tour of a real battleship and enjoy the museum at Nauticus. 3. Drive across and stop occasionally to see the sights or fish off of the Chesapeake Bay Bridge-Tunnel. 4. Bring out your creative side at the Chrysler Museum of Art. 5. Check out the beautiful gardens at Norfolk Botanical Garden. 6. Take a cruise on the Spirit of Norfolk. 7. Run through the fountains and wave as the ships pass by at Town Point Park. 8. Grab an ice cream at Norfolk’s famous Doumar’s. 9. Watch a Norfolk Tides game at Harbor Park. 10. Ride the metro system, The Tide, around town. 11. Ride the Paddlewheel Ferry from Norfolk Waterside to the Portsmouth side of the water. 12. Snap a few pictures in front of the giant anchor at Town Point Park. 13. Look at the fun animals at the Virginia Zoo. 14. Get pictures in front of 15-foot, bronze blue herons at the Hermitage Museum and Gardens. 15. Pay your respects at the Armed Forces Memorial. 16. Enjoy glass demonstrations at the Chrysler Museum Glass Studio. 17. Learn about the history of Douglas MacArthur at the MacArthur Memorial Museum. 18. Let the kids run around at the MacArthur Mall Play Area. 19. Check out trains at the Norfolk Southern Museum. 20. Take a tour of the Taiwanese Pagoda Tower and Oriental Garden. 21. Watch the Norfolk Admirals at the Norfolk Scope Arena. 22. Learn to two-step at The Banque. 23. Watch the planes take off and land at the Norfolk Airport. Check out when we did, here! 24. Make some sandcastles at the Ocean View Beach Park. 25. Enjoy skateboarding at Northside Skate Park. 1. Play and learn at the Children’s Museum of Virginia. 2. Test your sports trivia at the Virginia Sports Hall of Fame. 3. Take a carriage ride through Historic Olde Towne with Smithfield Horse and Carriage Company. 4. Watch a flick and eat dinner at the luxurious Commodore Theatre. 5. Check out the exhibits at the Portsmouth Art & Cultural Center. 6. Splash around at the Portsmouth Splash Park. 7. Hit the playground at the fun Portsmouth City Park. 8. Ride the Carrie B. Showboat. 9. Visit the Portsmouth Lightship Museum. 10.Go kayaking at Hoffler Creek Wildlife Refuge. 11. Take the kiddos to play at Gymboree. 12. Take a music, art, or dance class at Tidewater Studios for the Arts Inc.
13. Check out the Elizabeth River at Paradise Creek Nature Park. 14. Scuba Dive with your youth-aged kids at ScubaJam. 15. Take a train ride aboard the Pokey Smokey II. 16. Learn about the history of trains at the Virginia Railroad Museum. 17. Take a sewing class at Sew E-Z. 18. Go go-carting and paint balling at G-Force Karts. 19. Visit the historic Fresnel Lens on High Street. 20. Play laser tag at TAG. 21. Check out the Medal of Honor Monument. 22. Catch a concert at the nTelos Wireless Pavilion at Harbor Center. 23. Visit the historic Hill House. 24. Take a walking tour through Olde Towne. 25. Pick up fresh produce at Southside Plants and Produce. Thanks! 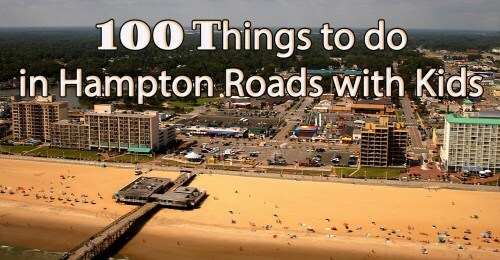 Hampton Roads has so many great things to do, what a great place to live! #22 Orb Family Center under Chesapeake is permanently closed. Thanks for letting me know! I will update my list accordingly! Another great place to go that has recently opened in Chesapeake, is Topgolf! Always have fun there! Thanks for the idea, Maddie!